Pidove in game: 10,797 Who? Important notice! Pokemon Pidove is a fictional character of humans. Pidove (Japanese: ???? Mamepato) is a dual-type Normal/Flying Pokémon introduced in Generation V.
It evolves into Tranquill starting at level 21, which evolves into Unfezant starting at level 32. 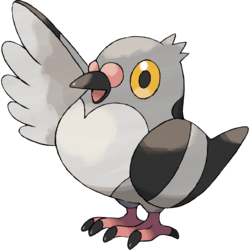 Pidove is a mainly gray, pigeon-like Pokémon. It has golden, oval eyes and a tuft of feathers atop its rounded head. It has a short, black beak with a bulbous pink cere, and a black patch on the nape of its neck. There is a wide, heart-shaped area of lighter coloration on its chest. Pidove's black wings have a thick gray stripe down the side. It has pink feet with black talons. Pidove is not particularly intelligent. While it always listens to its Trainer's commands, it does not always understand them. Having no fear of people, flocks of Pidove are often found in city parks and plazas, though they can also be seen in grasslands and rural areas. The cooing of these flocks can be very noisy. In Enter Iris and Axew!, after Ash was attacked by a flock of Pidove that later flew away, one was left behind. He battled and eventually caught her. She evolved into a Tranquill in A Venipede Stampede!, and then into an Unfezant in An Amazing Aerial Battle!. A flock of Pidove appeared in Climbing the Tower of Success!. A Trainer's and multiple other Pidove appeared in Team Plasma's Pokémon Power Plot!. A flock of Pidove appeared in In The Shadow of Zekrom!. Ash attempted to catch one in Enter Iris and Axew!, but he was attacked by the other members of its flock. After that, they flew away, except for one that he later catches. Multiple Pidove made an appearance in A Sandile Gusher of Change! with multiple Patrat and Deerling where they needed help from Ash and his friends. Multiple Pidove appeared in The Lonely Deino! under the care of a Day Care owner named Bobby. Pidove has made cameo appearances in Triple Leaders, Team Threats!, Dreams by the Yard Full!, The Bloom Is on Axew!, A Rival Battle for Club Champ!, A Connoisseur's Revenge!, Dancing With the Ducklett Trio!, Lost at the Stamp Rally!, Ash Versus the Champion!, A Maractus Musical!, The Four Seasons of Sawsbuck!, A Call for Brotherly Love!, Stopping the Rage of Legends! Part 1, Baffling the Bouffalant!, All for the Love of Meloetta!, Iris and the Rogue Dragonite!, Ash, Iris and Trip: Then There Were Three!, Beauties Battling for Pride and Prestige!, Curtain Up, Unova League!, and Mission: Defeat Your Rival!. Either in the wild, wild flocks or under the ownership of a Trainer. A Pidove briefly appeared in the elder's flashback in A Village Homecoming!. 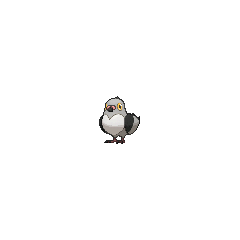 A Pidove appeared in Saving Braviary. Multiple Pidove appeared in Secrets From Out of the Fog! and Ash and N: A Clash of Ideals!. A Pidove appeared in The Island of Illusions! and in a flashback as well. A Pidove appeared in Searching for a Wish!. A flock of Pidove also appeared in Genesect and the Legend Awakened at Pokémon Hills. A Pidove appeared in Alexa's magazine in The Journalist from Another Region!. A Pidove appeared in Go, Go Gogoat!. A Pidove appeared in The Dream Continues!. A Pidove appeared in Kalos, Where Dreams and Adventures Begin!. BW002 Pidove Ash's Pokédex Pidove, the Tiny Pigeon Pokémon. A Pidove flock's cooing can get extremely noisy. Pidove is not attracted to shiny objects. A Pidove appeared in PBW5. A Pidove is one of the Pokémon employed by White in her BW Agency. N has a Pidove which he used to battle Black in Accumula Town in Letting Go. Cheren acquired a Pidove by the time he reached Castelia City. Later, in Driftveil City, it evolved into Tranquill. Pidove is one of the Pokémon young Hugh received from his grandfather. Moves marked with a superscript game abbreviation can only be bred onto Pidove in that game. Pidove fly over the beach. Their motto is not to do anything tiring, but they do like to play Chase. Occasionally erases one extra matching Pokémon elsewhere. For other sprites and images, please see Pidove images on the Bulbagarden Archives. 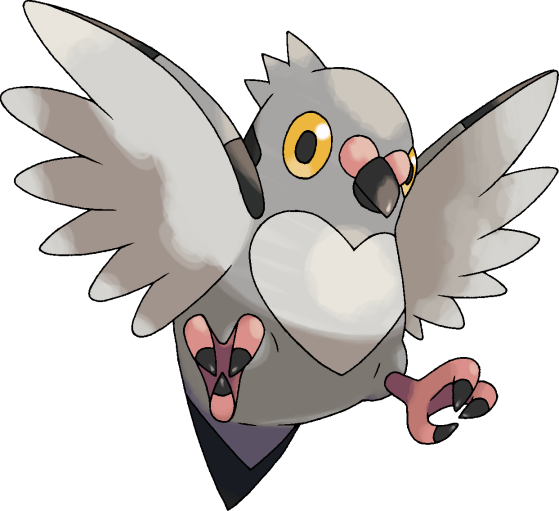 Pidove is the only Pokémon with a base stat total of 264. Pidove was the first Who's That Pokémon? for the Best Wishes series. Pidove seems to be based on pigeons and doves. Pidove is a combination of pigeon and dove. Mamepato may be a combination of ?? mame (diligent) or ? mame (prefix meaning tiny) and ? hato (pigeon). Korean ??? Kongdulgi From ? and ??? Mandarin Chinese ??? / ??? Dòudòuge From the Japanese ? mame and ? ge.